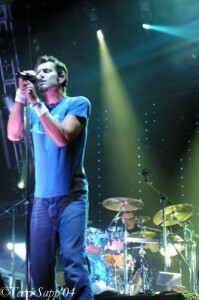 Oh, how I love 311, let me count the ways! 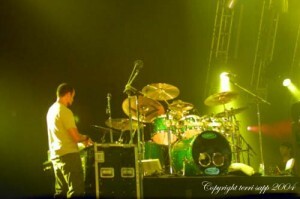 If I had the choice of ANY concert to attend with any living artist, I would choose 311 with NO hesitation. One sign of a great band is that they sound just as good, if not better, live as they do on their studio albums, which you would think to be unbeatable. Since the first time I saw 311’s perfect ensemble of musicians play their music live, I have made every effort to catch as many of their shows as physically and financially possible, because they have everything that makes a great band (including great fans)! This evening had a recurring blue theme going, between Chad’s blue drums, Tim’s baby blue guitar, and the beautiful blue (and other colored) bright lights. The set list definitely started as an even mix of old and new, with 2003 Evolver’s “Reconsider Everything,” Tim’s finger-pickin’ good Grassroots’ “Taiyed,” (which I always love to hear), and Atlanta’s first taste of 311’s interpretation of “Love Song,” originally from the Cure’s 1989 Disintegration album, now on 311’s newest 2004 Greatest Hits release and associated with the 50 First Dates soundtrack, which is fitting, as the movie and 311 are SO very “island.” Another first for Atlanta, Evolver’s “Give Me A Call.” According to the set lists, we were supposed to have heard this one the last time 311 came around, but they played another song instead. I guess it was our time this time. Well worth the wait. From here on out, 311 gave us a real strut down memory lane. 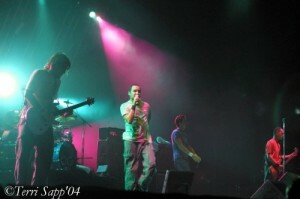 Beginning with “Don’t Stay Home” from the 311 album, which was one of the first singles I heard regularly on the radio. Also from the 311 album, one of my favorite island flavored songs, “Sweet,” which I don’t remember hearing since 1996 or 1997. This song has bass, guitar, drums, and sweet harmonies that make me long to chill on the beaches of Jamaica or something very relaxing like that. 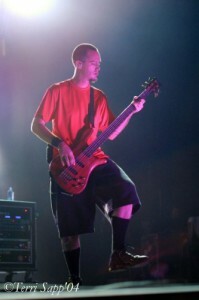 311 shot the video to the next old favorite from Grassroots, “Homebrew” here in Atlanta at the Masquerade Music Park. But even farther back than the title track from “Transistor,” Atlanta was once again taken back (for this “special occasion”) to the 1991 Unity unreleased “Summer of Love,” that was then re-released on the Omaha Sessions album spanning 1988-1991, since it was never incorporated into the studio released albums. It is always fun to think of 311 back when they wrote this, being teens getting started! The lights during this show were different and interesting…big long bulbs on each side of the stage, and a big screen in the middle with a million little lights (Light Bright style) that formed patterns and colors. During “Feels So Good,” there were bubbles and even the 311 logo in the lights. A myriad number of vibrant colors. When the guys came out for their encore, they were ready to “make a mess” and “blow off stress!” Evolver’s “Creatures (For a While)” was for sure a great choice for the first single from the album. What a fun song! P-Nut’s bass line is extremely bouncy. The question at hand is, ”Who’s Got The Herb?” SA’s effects and reverbs stand out on this Bad Brains cover from the 1996 Capricorn/Norml release, Hempilation. 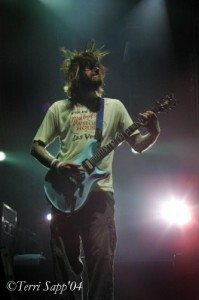 I also love Tim’s guitar melody, as so many other songs, he makes me want to sway and put my hands up in the air. Chad’s reggae drumming reminds me quite often why I love him so much! A most fabulous feature of this band is that they are all so talented that it is hard to pin point who I enjoy the most! Finally, 311 sent out the 311 album anthem, “Down” “to the old school fans here in Atlanta that have been down all these years” with “much love!” Every time I hear this song, it takes me back to that September day/night back in 1996 when my friend, Todd and I actually got to witness 311 play “Down” live on the David Letterman show at the Ed Sullivan Theatre in New York. After that, it has never been the same.